Blue Water Day Spa has become a popular destination for relaxation and wellness since it had opened its doors to the public in 2005. It had immediately distinguished itself as a premiere wellness mecca by offering innovative treatments, advanced therapies and breakthrough procedures. Its years of experience, expertise and world-class environment has earned numerous accolades here and abroad. Blue Water Day Spa’s latest offering is another breakthrough in skin care procedure called the 24K Gold Senses Facial Treatment. It’s about time to discover the power of gold. It was believed that back in the olden days, Cleopatra was able to maintain her youthful beauty by sleeping in a gold face mask each night to keep her skin looking firmed, toned, and supple. I was able to try this treatment myself last week. Again, as I always say, I may not be a beauty blogger so I know this isn’t really my turf. But I am not a neophyte when it comes to facial treatment. I’ve been to numerous facial center/clinics to avail of treatments and I ‘d like to think I might have a say on whether a particular facial treatment is a hit or a so-so. 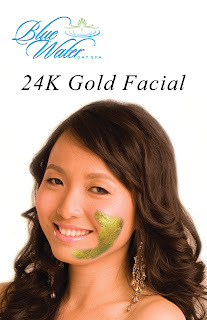 Here’s my two cents’ worth on Blue Water Day Spa’s 24K Gold Senses Facial Treatment: It’s a must-try for everyone. Imagine your face (or chin and neck part) being exfoliated by specks of 24K gold. It may look like any ordinary shimmering powder at first, but once it is spread on your skin, you can really feel it’s working. In my case, I felt some skin tightening (not too hard though) here and there, like some machine working its way to make my skin firm, especially on my double chin (yes, I have more than just two). The therapist’s gentle massage had almost lulled me to sleep; I just had to fight it because I didn’t want to be late for my next appointment that late afternoon. This breakthrough treatment from Blue Water Day Spa delays the natural signs of aging such as minimizing fine lines, wrinkles and sagging skin; rejuvenates the surface layer of the skin and increases blood circulation giving your skin luminous radiance. 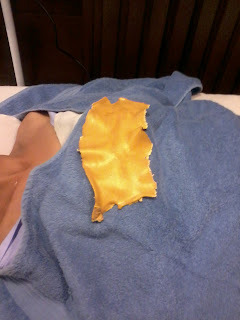 And what did I found out after having the 24k Gold Senses Treatment? I was surprised to find out that my skin had some natural glow! It also appeared cleaner and whiter. And here’s what I love the most about this treatment, I immediately saw the lift it had given my sagging chin and it had eradicate some of the lines on my face! If you guys want treatments with immediate results, this one suits you to a T. One word to describe this unique facial treatment: Awesome! It's never too late to care for your skin. Give your skin what it deserves. Feed your skin with gold the Cleopatra way. Check out the nearest Blue Water Day Spa near you. 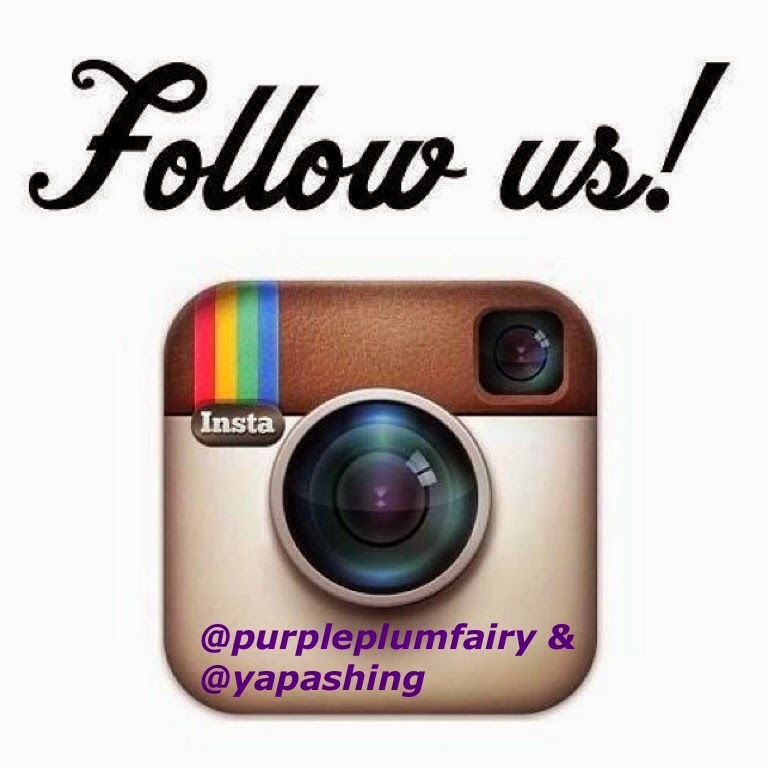 They have branches in Makati, Ortigas, Capitol Hills, Eastwood City, Tomas Morato and Cotabato City. 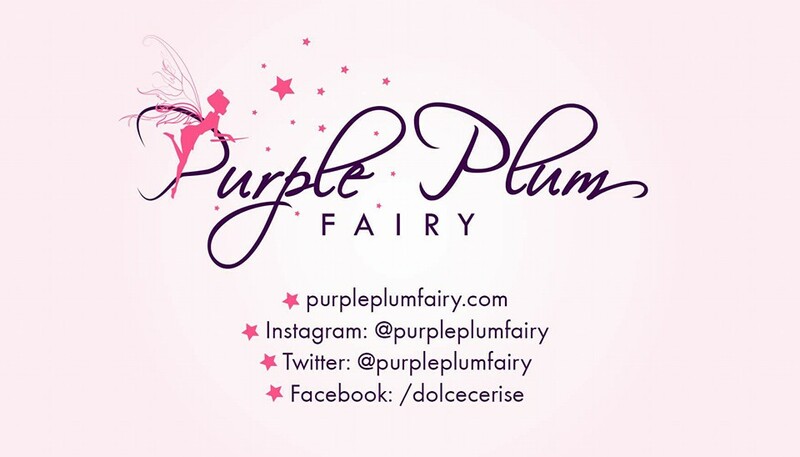 Purple Plum Fairy thanks Janese Halaboso, Lariza Garcia, Ms. Rikka Dylim, Ms. Nancy Go and the people at Blue Water Day Spa for the invite. U knows what I learn through your blog that is give your skin what it deserves. Feed your skin with gold the Cleopatra way which is a very good idea to nourish and give your skin a luxurious care so thanks for this sharing. Dermablend has a Soap for Your Skin Needs! Koala's March Helps to Cheer Us Up!